Brunello Cucinelli silk vest. Spread collar; two-way zip front. Sleeveless. Front flap pockets. Regular fit. Silk. Made in Italy. Model's measurements: Height, 6'1"/185cm, waist 31"/79cm, suit 40, shirt 15.5x35, inseam 32"/81cm. 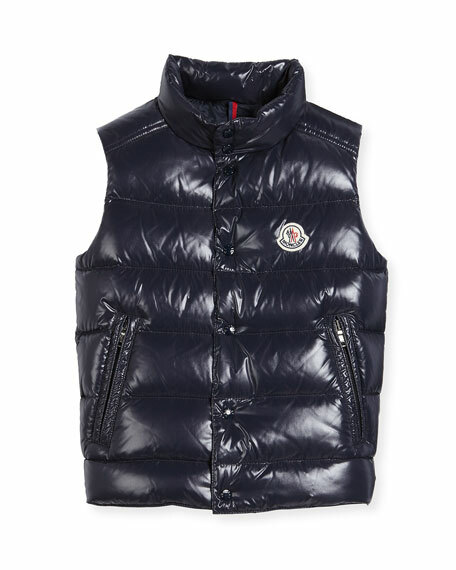 Canada Goose "Garson" 625 fill power down vest in technical fabric. Stand collar; snap placket with concealed zip front. Logo patch at left chest. Side slip pockets. Shirttail hem. Outer shell, polyester/cotton. Lining, nylon. Made in Canada. Model's measurements: Height 6'1"/185cm, waist 32"/81cm, typically wears size M.